Irish deliveries may be made any time between 8:00am and 8:00pm. Please try to ensure that there is access to the delivery property during this window, however if you are not at home ,our couriers will attempt delivery to a secure location or leave your parcel with a neighbour. You are able to return unsuitable items within 14 days of the date shown on the dispatch note. Please return unsuitable items in its original packaging. Please note, we cannot offer refunds on swimwear if the hygiene seal is not in place or has been broken. HOW DO I RETURN AN ITEM (RETURNS LABELS)? 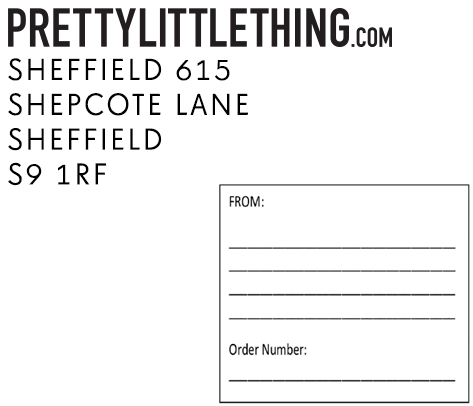 Cover your address label with the PrettyLittleThing returns label found on the bottom right of your delivery note. Alternatively you can return the package by using the Post Office counters and obtain proof of postage from the Post Office. Please do not post the package through the post box without obtaining a receipt of postage. Please keep your proof of postage safe incase you need this as your proof of return. If you haven’t got your returns label don’t stress! You can download a new one here.